"The various authorities do not agree concerning the details of the miracle whereby the true Cross of Christ was discovered. Some say that it was a dead maiden being brought to burial who was raised by the power of the Cross; others claim that a widow lay ill in her house and was close to death and that the Patriarch [Macarius] and the Empress [Helen] came to her bearing the [three] crosses [to see which was the true Cross]. They laid them on the ailing woman and when the Cross of the Lord was placed upon her, she immediately arose whole. Others say that a dead man was being carried to the grave and was resurrected at the touch of the Cross of the Lord. Nikephoros Kallistos, surnamed Xanthopoulos, in the twenty-ninth chapter of his eighth book, says that both those marvels were worked at that time and that the widow who lay ill and dying in her home was delivered from the gates of death and granted life and health and that the dead man who was being carried to the grave was resurrected." Saint Helen, the mother of Saint Constantine the Great, when she was already advanced in years, undertook, in her great piety, the hardships of a journey to Jerusalem in search of the cross, about the year 325. A temple to Aphrodite had been raised up by the Emperor Hadrian upon Golgotha, to defile and cover with oblivion the place where the saving Passion had been suffered. The venerable Helen had the statue of Aphrodite destroyed, and the earth removed, revealing the Tomb of our Lord, and three crosses. Of these, it was believed that one must be that of our Lord, the other two of the thieves crucified with Him; but Saint Helen was at a loss which one might be the Wood of our salvation. 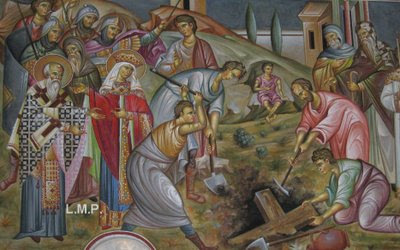 At the inspiration of Saint Macarius, Archbishop of Jerusalem, a lady of Jerusalem, who was already at the point of death from a certain disease, was brought to touch the crosses, and as soon as she came near to the Cross of our Lord, she was made perfectly whole. Consequently, the precious Cross was lifted on high by Archbishop Macarius of Jerusalem; as he stood on the ambo, and when the people beheld it, they cried out, "Lord have mercy." It should be noted that after its discovery, a portion of the venerable Cross was taken to Constantinople as a blessing. The rest was left in Jerusalem in the magnificent church built by Saint Helen, until the year 614. At that time, the Persians plundered Palestine and took the Cross to their own country. Late, in the year 628, Emperor Heraclius set out on a military campaign, retrieved the Cross, and after bringing it to Constantinople, himself escorted it back to Jerusalem, where he restored it to its place. Rest from labour. A strict Fast is observed today, whatever day of the week it may be.